Which, as it turns out, is a quiet place on a Sunday afternoon. It was far enough away, however, and the getting there involved enough serious-effort-inducing hills, that upon arrival we felt we were exploring a whole new town. So cheery were we with our adventurism, that an eatery by the name of It's All Good Cafe seemed a natural fit. Enhancing the illusion that we had crossed significant borders in our journey from Brunswick East to Kew was a menu of straightforward cafe favourites - not a drop of rosewater or spoonful of labne in sight. As such, I was inspired to partake of a classic myself: caesar salad. 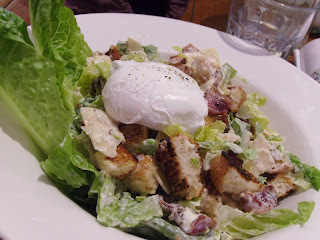 It delivered everything a caesar should: goopy egg yolk mixing with tangy caesar dressing (which was just bordering on excessive), complemented by salty bacon and all bulked up with chunky croutons and plenty of cos leaves. A caesar salad is, to me, is a meal for mind and stomach. It's undeniably a salad - placatory to the mind when there's been a little too much of the fried and fatty going on - but it's satsifying to the stomach in a way a green (or lower-fat) salad isn't for most. The same theory applied to a recent burger excursion to Fishbone. It may have sounded like a strange request: Can I get the veggie burger but with a meat pattie? 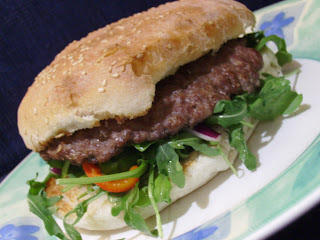 I wanted a burger, but I didn't want that heavy after-feeling of grease, onion breath and indigestion. Fishbone's veggie burger comes with pesto, rocket, red onion, capscium and mushroom, which sounded like - and indeed was - a fine accompaniment to their moist but firm meat patties. A new Brunswickian recently tried Fishbone and commented they weren't all that thrilled on their chips, which have always been a highlight for us. On the veggie burger occasion we got take-away and I will say that the chips did get a little soggy on the trip back home. My tip: make a night of it in that part of Lygon St. Grab a table and eat in at Fishbone; head across the road for a Coopers at the Comfortable Chair craft beer at the Alehouse, then head for dessert at Gelobar.